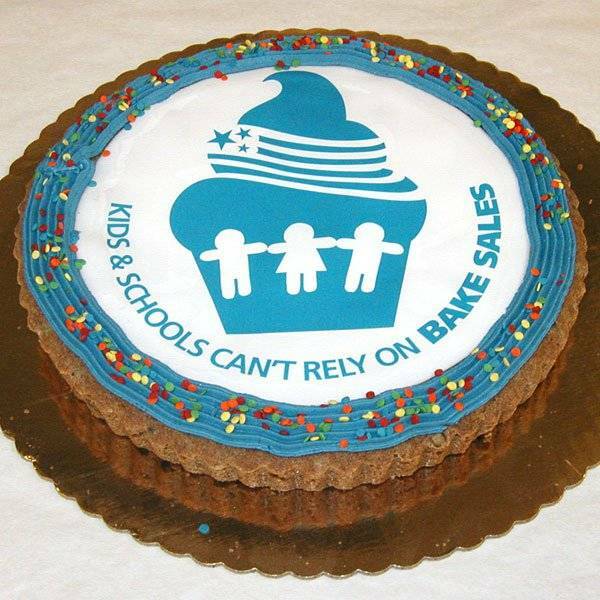 A classic cookie cake filled with rich chunks of chocolate, hand-iced and printed with your company logo and message. 1 week room temp. or can be frozen for 3 months. 3-4 Days (plus transit time). Rush Service Available. Large orders (50+) need more time. Our famous Chocolate Chip Cookie Cake decorated with your custom colors and logo. Who can resist the bold flavors of cookie dough and giant chunks of chocolate? Just the smell of fresh-baked cookies alone is enough to bring back delicious memories. Next, our bakers hand-decorate the design using royal icing around the edges. Your company logo design comes out looking perfect and tasting great. Bring on the giant glasses of milk!